Shortly before the trade fair began, we were informed that President Obama would like to visit a few exhibitors in our hall on Monday, the first day of the trade fair. No, WIKA was not on his agenda – a shame, really, because our coffee is the best – but for all that we got to watch the whole fuss about security. That meant, construction of the booth had to be moved forward, so that the CIA and the BKA (German Federal Criminal Police Office) could search and seal up the halls on Sunday prior to the trade fair. The names of the personnel for Monday had to be communicated to the BKA for verification. After clearance, we received special security badges. 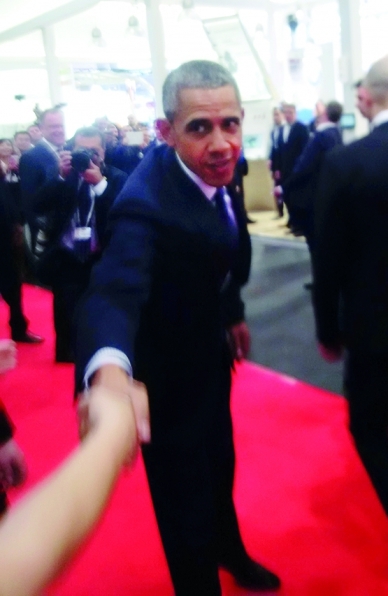 Barack Obama shaking hands at the fair: Elke Knobling had only seconds to take this souvenir snapshot. As the safety officer, I had to make myself available to the police on Sunday for an inspection of our booth. After a long wait, I was then taken to the booth with a “bodyguard”. Even the smallest of packages were open­ed, flower arrangements were searched, exhibi­tion devices were disassem­bled, things were looked into in which I would have never in my life suspected anything. Then water started leaking from an exhibit and the booth soon had a pond! Mopping up under police supervision with a grim look­ing police dog made me break out in a sweat. Monday turned out as expec­t­ed. Swarms of photographers made it almost impossible to catch a glimpse of the VIPs. The hall was opened again to the pub­lic at 1.00 pm. This meant loss of business for half a day – without any compensation or reduction in costs. Nevertheless, the trade fair was a success for WIKA.